Searching for the right job can be a tiring process, especially when you are spending your every waking minute to find a job. People use different tactics to get the job they want and really work hard to land their dream job, but even after so many efforts if you are still waiting for an interview call, then this is high time for you to make some changes in your job searching tactics. We say we are modern but we hardly do innovative things to land the job, even so, many people stick to the order of searching online, apply and then wait for the interview call. Do you think all the companies have so much time to go manually to hire one or two employees? Will they go to waste that much time in filtering resume and calling for an interview? No, a big no and that’s why you need to change your job search tactics. 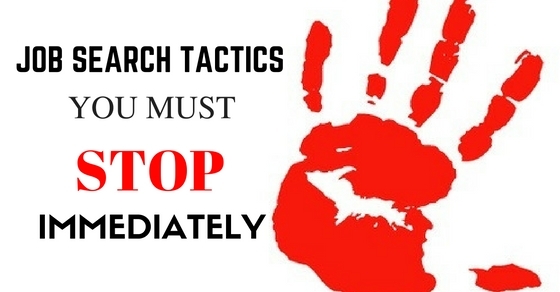 There are many job search tactics you must stop immediately if you want to work for your dream company. These tactics may look good from your point of view, but in reality, they are keeping you from your success. In this article, we are going to discuss these tactics so that you can know more about these tactics and can take appropriate actions. As the time is changing and the world is transformed into a global village where hiring and recruiting hardly take much time and companies use short and effective methods to do the hiring. If you think online job searching is the best way to get the job and you are one of those people who applied for the job within an hour of its posting online then you are poorly mistaken. Online job searching is outdated and you need to use other tactics other than online because spending all your precious time in online searching puts you out or you will wait for long before any opportunity hit your door. Another factor which makes online job searching less successful is the fact that online job posting and hiring a candidate that way is a lengthy process and take lots of time as well as a company asset that’s why most companies search potential candidate in their circle first. So, if the online job searching is your favorite way to search for the job, then it is high time to change that. Use another method like a network within the company you want to work and take the direct approach even if you are applying for the job on the job portals. What do you think when you apply for all sorts of the job? That the HR department of a company has no work other than reading your resume and understand what you can do and what you cannot? Applying for the job which is not something related to you is an idiotic move on your part; you are just wasting time, energy and confidence level. First, determine what kind of job you are looking for then prepare your resume according to the job you want and then apply for the job which is relevant to your resume. No one has time to waste over resume which doesn’t state the right thing, so keep that in mind. Don’t waste your precious time and energy over something which has nothing to do with your needs and stop the tactic of applying for the entire job you see available for hiring. Make yours and others work easier and concentrate on your resume and job. Think of a situation that you are working in a company of your dream and one day you meet someone who was searching for the job, you hardly get time for introduction and the said person force his/her resume in your hand with a plea to forward it to your HR manager, what will you do? Will you forward that resume to your HR or going to throw into the trash bin? Most probably you are going to throw it in a trash bin or put somewhere out of reach because you hardly know the person or don’t want a headache. Now, after thinking apply the situation to you when you force your resume on someone even before you have a proper introduction. Change this tactic of yours because it’s just going to waste your time and you will make a fool of yourself. First, have a proper introduction, then ask if or will they forward your resume to the HR and if they say yes of course only then give them your resume and thanks generously whether they take your resume or not. It is good to be a confident, professional, but there is a very thin line between confidence and pestering. Yes, it is said that if you want something, then ask for it, don’t waste time in waiting or beating around the bush, but you should know the limit if you follow this tactic. People often start to pester the recruiter, hiring agencies or HR managers for the update on their resume which is a big no if you really want to get the call for the interview. Your pestering may put them off and they deliberately avoid calling you for the interview because you come as more desperate than talented. So, stop that tactic if you really like to receive the interview call. You can send an inquiry about the job if you don’t hear any hiring with a thank you note, but do not call them again and again. No company wants an employee who is desperate and clingy that means they are not confident about their work and skills. You are following company website you want to work with and constantly check the career column so that you can apply first whenever a company post for the hiring but still doesn’t get any opportunity. It may look like the company doesn’t have any vacancy for the hiring, but the truth is most companies use their in-circle or try to find on websites like LinkedIn within connections to hire the candidates so that they can get a better and reliable employee. So now you understand why you are not getting any news about hiring in your dream company? This tactic only gives you hope nothing else, so stop this search tactic to find the job and try to find the connection over LinkedIn or through networking and use direct approach so that you can have a call for an interview. Companies like references more because they trust their employees better than someone coming from outside. Are you one of those people who apply for different fields at the same time? If yes, then this tactic of yours to find the job can make the biggest fool of you. What do you want to reflect on what you are writing in your resume? When you don’t know exactly what you are looking for, you make your resume clutter of information which doesn’t have anything clear and focus. So focus on one job at a time and dedicate all your energy to finding the job. Do your homework, research and get all the information about the job and the requirement for the job. The tactic of applying for a variety of jobs and thinking you will get the chance at least in one is just the foolish method. It keeps your mind distracted and makes you unable to focus on one job at a time. If you want to change the field of your work, then prepare for it. Like any smart job seeker, you have a great resume, perfect design and meticulously laid out information, but are that enough to get the job? The global village we live in need more than just a perfect resume over the paper and you are surely mistaken if you think having a resume is enough to get the job you want. People are smarter than before and they all seek what you are trying to grab. What you have that they do not possess? You need to keep these things in mind so that you can understand the need for specialization in the global village. The job searching tactic of just having the perfect resume is needed to stop immediately because you need more than that. Add extracurricular activities and make an active profile online, you don’t need a web page, but a dedicated profile which can show your achievements and the work you had done as well as promote you as a potential employee. Websites like LinkedIn are a great example of having a professional online profile. If you think of clearing Facebook profile of everything controversial and limiting the use of social media can help you in landing the job then you are very wrong. Companies now look into a social media profile of the potential candidates to know about their social behavior and their relationship among friends. Your inattentiveness over social media can point you out as the person who does not understand the importance of social life or there is something you are hiding if there is not enough information. Social media connect you to the world we called global village and give you the opportunity you may never find without social media. So if you are thinking inattentive social media presence is the right tactic to find the job, then stop it immediately because now social media is a great way of networking where you can connect with like-minded people and professionals from all over the world. When people start to search for the new job they often change their field due to many reasons but changing the line of work is not that easy. You may not know how to work and do not possess the necessary skills for the work, but the main problem arises when you use the line ‘I am good learner’ all the time to land the job. Using lines like this only proves that how inappropriate you are for the job. The right method shows the employer how your knowledge and experience of the different field can help and how you are the best choice. No one wants to listen ‘I am a good learner’, they want to prove that yes you can do the work more efficiently than someone from the same field. Stop using this tactic immediately to impress your potential employer because it only causes damage to you which may cost you your potential job. We know how hard work you had done to get the job and how qualified you are but this doesn’t work if you do not use the right methods and tactics to land the interview. There are few tactics we all use and think they will work, but the reality is with time, approach also changes and old tactics only cause delay and problem. In this article, we had listed few tactics which work against you rather than helping you even when you are the best candidate out there. We hope this article really helps you in improving your approach to job search and you get the job you are looking for. Never give up because it may take time but hard work always pays off in some way.